About The Paper for The Droodle - waterproof notepad - Write. Rip. Repeat. 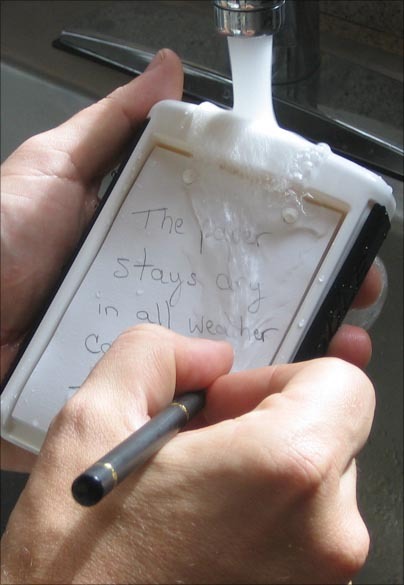 The Droodle™ uses Rite in the Rain all-weather writing paper, a patented substrate created for use in outdoor writing situations by JL Darling Corporation . The paper can be used and recycled just like any standard office or indoor paper. Although the paper is manufactured to be used in extreme environments and contains the most durable components available, JL Darling Corporation and Rite in the Rain ensure that the paper is manufactured with high environmental and social standards and practices. Try the paper in any wet environment – the shower, the pool, the rain, the ocean, the bath, the kitchen… it really works! Use a standard pencil or pen, it doesn’t matter. Water simply beads up and rolls off the paper, leaving you with only your inspiration, captured for all posterity!